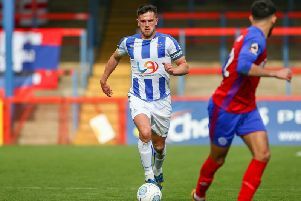 Despite having just 13 senior players available, Hartlepool United boss Craig Harrison says he can’t wait to see his players get back out on the park tomorrow. Pools are riding the crest of a wave having won their first National League encounter for three months against Woking at the weekend. And even though his options are limited, Harrison is desperate to patch his wounded troops up and send them back out at the Shay, in what is yet another National League relegation six-pointer against Halifax Town. When asked whether having a game so soon after the weekend was a good or a bad thing, Harrison replied: “We all want to play, they all work in training but want to play. “Modern day sports science stops players these days. Years ago Liverpool won every competition with 14-15 players, now it takes a lot more than that. I think we all know that it is somewhere in the middle. With all the off-field strife Pools has been a very difficult place to work of late. But Harrison has revealed things have significantly changed in recent weeks, especially at the club’s Durham University training base. “Confidence now here is high and it’s been a different place in the last two weeks, a lot lighter and better not as serious,” said the manager. “It’s important to keep the fun and you want to work hard and enjoy the environment. “There’s been a buzz in training and first 45 minutes we were fantastic, aggressive. It would be nice to keep a clean sheet, but winning is important. When quizzed why he thinks the mood in the camp has lightened of late, he said: “At some point reality has to sink in and for want of a better explanation you have to snap out of the circle.